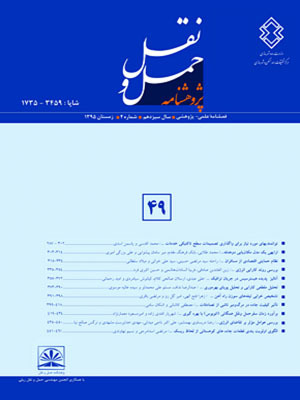 شفابخش, غلامعلی, اکبری, مهدی, حداد, عبدالحسین, گواشیری, زهرا. (1387). امکان‌سنجی اجرای دیوار خاک مسلح با ژئوسنتتیک و بررسی موردی آن در جاده ویژه گلستان. پژوهشنامه حمل و نقل, 5(1), -. غلامعلی شفابخش; مهدی اکبری; عبدالحسین حداد; زهرا گواشیری. "امکان‌سنجی اجرای دیوار خاک مسلح با ژئوسنتتیک و بررسی موردی آن در جاده ویژه گلستان". پژوهشنامه حمل و نقل, 5, 1, 1387, -. شفابخش, غلامعلی, اکبری, مهدی, حداد, عبدالحسین, گواشیری, زهرا. (1387). 'امکان‌سنجی اجرای دیوار خاک مسلح با ژئوسنتتیک و بررسی موردی آن در جاده ویژه گلستان', پژوهشنامه حمل و نقل, 5(1), pp. -. شفابخش, غلامعلی, اکبری, مهدی, حداد, عبدالحسین, گواشیری, زهرا. امکان‌سنجی اجرای دیوار خاک مسلح با ژئوسنتتیک و بررسی موردی آن در جاده ویژه گلستان. پژوهشنامه حمل و نقل, 1387; 5(1): -. دیوارهای حائل از جمله ابنیه فنی هستند که در شبکه‌های حمل‌ونقل جاده‌ای و ریلی کاربرد گسترده‌ای دارند. برای سالهای متمادی از دیوارهای حائل غیرمسلح استفاده می‌شد. هرچند طراحی این دیوارها ساده و مصالح آن نیز در دسترس هستند اما عملکرد این دیوارها محدود است. به این علت، احداث دیوارهای خاک مسلح توسعه پیدا کرد و با توجه به قابلیت‌های فراوان ژئوسنتتیک‌ها (خصوصاً تسلیح‌کنندگی و زهکشی)، طراحی و اجرای این نوع دیوار خاک مسلح به طور روزافزون گسترش یافت و امروزه بسیار مورد توجه قرار گرفته است. امکان‌سنجی اجرای این گونه دیوارها فرصتی است تا این دیوارها را مورد ارزیابی‌های فنی و اقتصادی و تحلیل اعتمادپذیری قرار داده و تأثیرپذیری از محیط را بر روی آنها بررسی کنیم. تحلیل‌های اعتمادپذیری نشان دادند که دیوار خاک مسلح با ژئوسنتتیک از اعتمادپذیری بیشتری برخوردار بوده و نسبت به تغییر پارامترها حساسیت کمتری دارد. در این مقاله همچنین به ارزیابی اقتصادی دیوارهای حائل خاک مسلح و متعارف نیز پرداخته شده و در آن هزینه احداث انواع دیوارها با یکدیگر مقایسه شده‌اند. نتایج به دست آمده از ارزیابی‌ها نشان دادند که احداث دیوار خاک مسلح تا ارتفاع 6 متر گران تر از دیوار حائل وزنی با مصالح سنگی است. اما در ارتفاع بیش از 6 متر، دیوار خاک مسلح کمترین هزینه ساخت را دارد. نهایتاً در مطالعه‌ای موردی مربوط به جاده ویژه گلستان امکان ‌سنجی احداث این گونه سازه‌ها مورد بررسی قرار گرفت. برای انجام این مطالعه، پس از بازرسی منطقه و جمع‌آوری داده‌های طراحی، دیوار خاک مسلح با ژئوسنتتیک طراحی شده و با توجه به تحلیل‌های اعتمادپذیری، اقتصادی و تأثیر محیط، اجرای این نوع دیوار حائل امکان‌سنجی شد. نتایج این مطالعه حاکی از آن بود که با وجود آن که از نظر هزینة احداث دیوار خاک مسلح در امتداد جاده ویژه گلستان مقرون‌ به صرفه و قابلیت اعتمادپذیری آن نیز قابل‌قبول است، اما به دلیل آسیب‌پذیری دیوار خاک مسلح ژئوگریدی با پوشش ژئوبلوک در برابر جریان‌های سیلابی، که غالباً سنگ‌های بزرگی را همراه خود جابجا می‌کنند، در تصمیم‌گیری‌ها، احداث این نوع دیوار حائل کنار گذاشته شد. Retaining wall is one of the structures that have being used extensively in road and railway networks. Over time, the classical gravity walls transitioned into cantilever reinforced concrete types. A paradigm shift occurred in the 1960s with the advent of Mechanically Stabilized Earth (MSE) masses, i.e., reinforced layers of soil allowing for modular construction. The reinforcement was initially steel straps, and subsequently welded wire mesh provided an alternative. By the 1980's the MSE technology used polymeric reinforcement like geotextiles, geogrids and other polymer straps. As geosynthetics have many advantages (certainly reinforcement and drainage), nowadays designing and implementing of such retaining walls grows rapidly up and more attended.Applicability Study of Geosynthetic Reinforced Soil Walls gives an opportunity to evaluate technical and economical issues of these walls, analyze reliability of their internal stability and investigate environmental effects on their structures. This paper (based largely on Golestan special road study) will present a comparison of technical notes of different types of retaining walls, and then follow with their reliability analysis about internal stability of geosynthetic reinforced soil walls. It will then present economical analysis and compare cost data of building different retaining wall such as gravity walls (masonry block and concrete), cantilever reinforced concrete and geosynthetic reinforced soil walls. Finally it will study applicability of implementing this process for Golestan special road. This process and some results of this research will be given as follows.Comparird to gravity or reinforced concrete, geosynthetic reinforced soil walls are more flexible, and have the ability to absorb the earthquake forces much better. They can support more displacements than other wall types, so usage of them on soft soils, in areas with high possibility of earthquake and also for high height embankments are suitable and have cost effectiveness.In other part of this research, authors take economical analysis to compare results as which type of wall and in which height has alternative benefit. After examining site plan of study case base and detecting designing parameters, the denoted retaining walls were designed, then the total cost of their construction were computed and the results were illustrated in a chart. Comparison of illustrated cost data shows that cantilever reinforced concrete walls are by far the most expensive, with gravity walls (masonry block and concrete) significantly less expensive. Note that gravity walls are rarely over 6 meters in height. This limitation first comes from their high mass weight and earthquake considerations. In the other hand, supporting materials would be difficult. It is also obvious that in height between 6-10 meters, geosynthetic reinforced soil walls are the least expensive of all wall categories. Nonetheless in height less than 6-m geosynthetic reinforced soil walls have better reaction to variation of displacement and take less affect under lateral forces such as earthquake loading. By comparing economic surveys, it becomes appeared that geosynthetic's prices have a significant effect on the total cost. So if our manufactures produce these materials in the country, total cost of geosynthetic reinforced soil walls will be decreased.Last step of applicability study is considering the impact of environmental and natural issues on walls serviceability. Some of the degradation properties include sunlight (ultraviolet radiation), temperature, oxidation and hydrolysis, chemical, radioactive and biological degradation. There are several environmental issues that affect such walls, but in this certain area, floods make critical situation for wall's structure. Floods moved huge stones to wall face and soil layers may be scoured. As results of this paper reflect, geosynthetic reinforced soil walls, although, have economical benefits and its reliability is acceptable, their sensitivity to environmental issues caused not to take them as alternative to avoid golestan special road oppose concerns.